I like panel 1, how each special agent has a different pose, is on a different plane of depth, has a different face, body, etc. (The agent with his arms out straight is based off John Turturro). I like the way the eye-read leads to the Mark’s mask being held out as the most foreground element in the composition on the utmost right of the panel. On the other hand, the drawing of the children at the bottom of panel 4 creeps me out, especially the one on the far right. 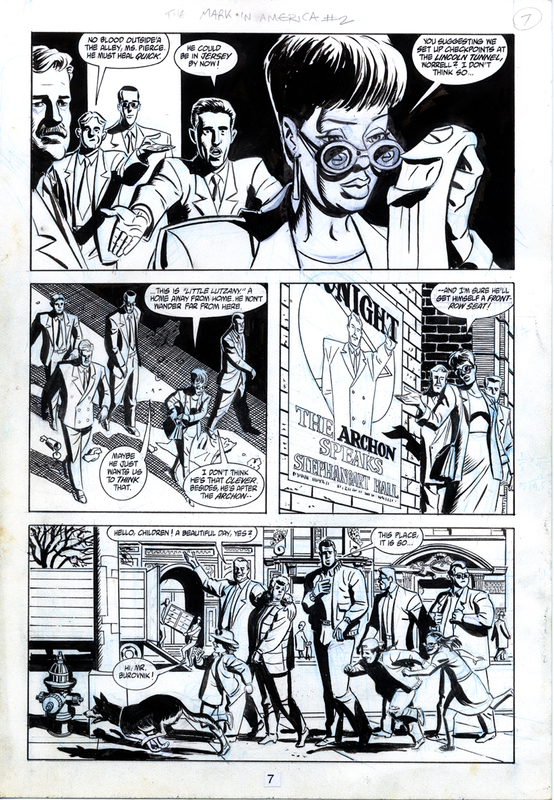 This is page 7 for "The Mark" issue 2, volume 2, otherwise known as "The Mark In America", published by Dark Horse Comics in January 1994. Written by Mike Barr, drawn by Brad Rader.